This small website is devoted to the mysteries of the Minoan civilization, its language and anything we can decipher out of it. Feel free to share your thoughts through comments or by sending me an e-mail. In my next post, I shall briefly tackle an interesting and very popular approach to the research of ancient Aegean languages. It is all about the faint traces a language can leave after millenia of its disappearence: the toponyms or place-names. Thanks to the conservative nature of our species, while conquests, migrations or cultural assimilation may swap the ethnic composition of entire regions, names of towns, mountains or rivers often survive without any major change. For example, while the overwhelming majority of Turkey now speaks an altaic language, towns and villages of Anatolia preserve their names from the Byzantine era, some of them even have original Hittite names - only in a slightly changed form. The fact that a large portion of toponyms in ancient Hellas were actually of non-Greek origin, has already drawn attention in the beginning of the 20 century. Professors Blegen and Hailey have published their milestone article in 1928, analysing a large number of ancient toponyms in and around Greece. They come to the conclusion that there is a surprising homogeneity among toponyms found in Greece and western Turkey, pointing to an unexpected lingustic union in these regions predating the "coming of Greeks". They have also found intriguing patterns in the way these names were formed. The most typical and common ones were place-names ending in either -nthos/-ntha or -(s)sos/-(s)sa. Other scholars later expanded their lists and confirmed their findings. What I shall do now is show a good collection of these toponyms on maps, to give you an approximate picture of their geographical distribution. It took me a good deal of time to comply. My main sources were Blegen & Hailey (JSTOR, 1928), the neat list of Best & de Vries & Brill (Book title: Thracians and Myceneans, 1989), the Barrington Atlas (published in 2000), and many other minor articles. I admit I may not be the best in calculating geographic coordinates: if you encounter any major error or can give me further examples I could put on my map, let me have them. I welcome any comments, as always. First of all, let us analyse the first class: Names ending in -nos/-na are among the most commonly seen in southern Hellas and western Asia Minor, also on the Cyclades and Crete. These are the most overlooked ones, too: Despite their "ordinary look", most of them do not possess any meaningful Greek (or even Indo-European) ethymology. On the other hand, they perfectly fit the pattern we would expect from adjectives in some ancient languages of Aegean origin. The suffix -na is well-attested in Etruscan, and also found in Eteocretan (Φραισονα = "Praisian", from the town of Praisos). Conforming this pattern, many names falling into this category have no vowels inserted between the stem and the *-na suffix. This is quite an un-Indo-European feature, yet perfectly explicable by a once-widespread "Aegean" presence in the area, from what Eteocretan, Eteocypriot, Lemnian and Etruscan are just meager, relictual remains. It should not be forgotten that there does exist a similar (perhaps very distantly related) Indo-European formative *-en-, but the IE languages tend to preserve that -e- vowel. 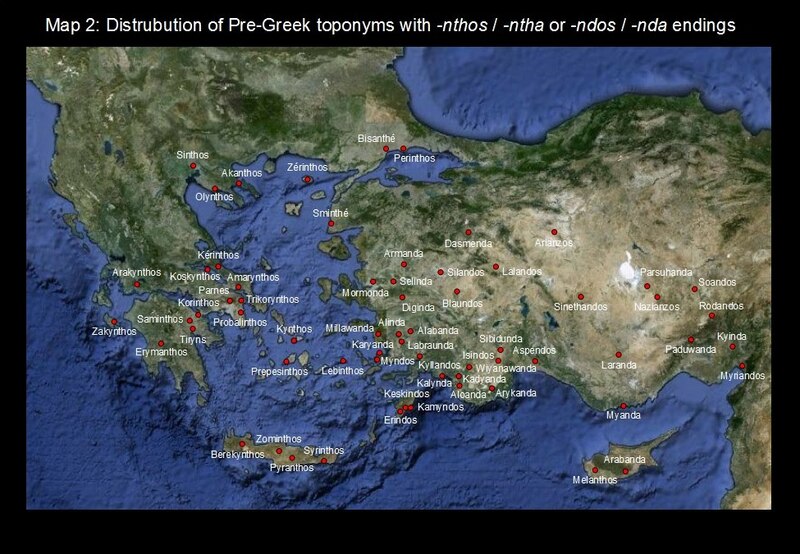 Toponyms ending in -nos/-na are widespread all around the Aegean, also found on Cyprus and even in Eastern Anatolia. Yet the latter ones are generally thought to be from Hurrian and Hattic but not Aegean origin. Originally, most of them did not end in -na. This is demonstratable in quite a few cases, e.g. Tyana comes from Tuwanuwa and Adana from Adaniya. On the other hand, there is a surprisingly high concentration of originally *-na-type names on Crete, some of them already mentioned in Linear B sources (e.g. Itanos as U-TA-NO). 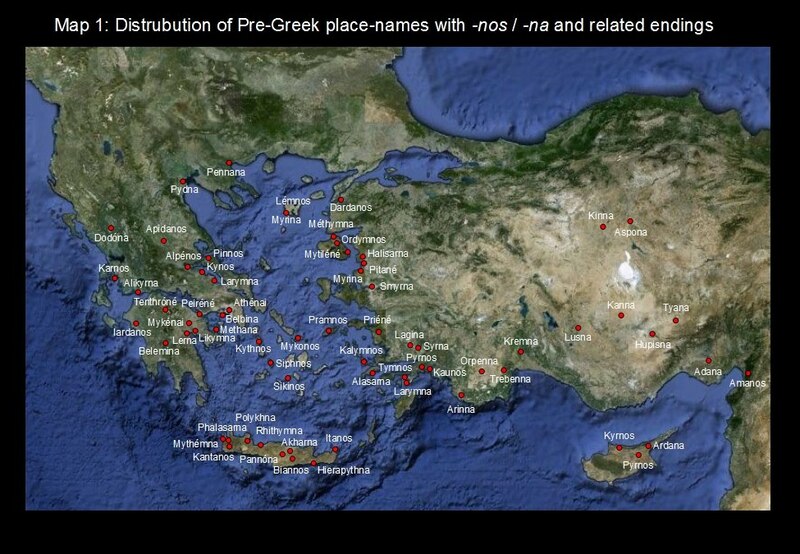 Thus there can be little doubt about the close relationship between the language of Minoan Crete and those "Aegean" languages once spoken in Mainland Greece and Western Anatolia - only evidenced by their toponyms. To the second major class of toponyms belong names ending in either -nthos/-ntha (Mainland Greece, Cyclades, Crete) or -ndos/-nda (Ionia, Lydia, Rhodes, Lycia). This type is slighly less common in Greece than the others, yet I managed to glean a sufficient number of examples to show that their geographical distribution is no different from the other "Pre-Greek" place-names. In Western Anatolia (especially in Lycia) on the other hand, they are the most typical toponyms. Apart from these main versions, there is also a variant in -nza/-nzos seen in Eastern Anatolia. 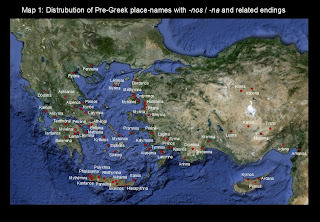 Some Greek toponyms end in normal -s in their nominative case, only showing the -nth- stem in oblique cases (e.g. Tiryns [gen: Tirynthos]). Heteroclites were absolutely typical in Ancient Greek, adoption of this feature on non-Greek terms shows how perfectly these names were assimilated into early Greek. When trying to interpret the meaning of this suffix, we encounter unexpected difficulties. Mycenean Greek had no such formative; and it was not used by Etruscan, either. But from the analysis of loan-words entering early Greek (e.g. Labyrinthos, etc), it is obvious that this suffix must have been existing, and still productive in Minoan. Fortunately it also existed in ancient Anatolian languages, like Hittite and Luwian, whence we can find out the exact meaning. Interestingly enough, Hittite presents us not only one, but two classes of such endings. One of them, the -wand- formative has a general possessive sense of meaning (e.g. esharwands = 'bloody' from eshar = 'blood'). This one is perfectly explainable from an IE *-went- suffix, sporadically also seen in Mycenean Greek (e.g. O-DA-TWE-TA = οδόνταϝέντα (odontawenta) = 'teethed'). The other ending is the fairly common -and- formative, carrying a 'collective' sense of meaning (e.g. udneyands = 'all lands' from udne = 'land'). It was also used as an "agentive", when forming subjects from neuter nouns. The same structure is also seen in the Luwian "collective plural": For example, the word dawi = 'eye' admits a normal plural dawa meaning 'eyes'. But when speaking about eyes of different individuals, the correct plural form is dawanda. Although some linguists seek to derive the latter formative with the Proto-IE *-ent- present participle, the collective meaning is hardly explainable. It is a more reasonable explanation that this is non-IE loan structure. Conforming this duality, a high number of Greek toponyms actually has an ending in -u-, i.e. -ynthos. The rest most commonly ends with -i-, as -inthos. These would conform to the -wanda and -anda endings of Anatolian toponyms. What is strange, the -ynthos type toponyms are also found on places, where no early IE presence could be expected, such as Crete. And when we remove the -ynthos ending, we get stems practically meaningless in Greek. We are left with the conclusion that some ancient, supposedly non-IE languages used these formatives, and while the *-(i)ntha ending might be orginally Aegean, they might have borrowed the *-wuntha (-ynthos) version from some early Indo-European language, perhaps an Anatolian one. Last, but not least, there is the group of toponyms ending in either -ssos/-ssa or simply -sos/-sa. This is the most populous class by far. In a geographic sense, it also extends further than any other type. Many examples can be gleaned from outside the Aegean, such as Naissos (present day Niš, Serbia), Orgyssos (in Illyria) or Arabissos (in the Taurus mountains, eastern Turkey). One cannot exclude the possibility of either the Greek colonists spreading "usual" place-names of Hellas, or simple hellenization of local toponyms, no matter how meaningless these were for Greek speakers. Though the Thracian names in -dessa do not seem to belong here (I did not put them on the map either), we can also see variants in -ttos/-tta, conforming the Ionic Greek dialects. Almost all the languages originating in the region have had a version of this formative: The -(i)śa suffix was used by Etruscans as a patronymic. In Anatolian languages, the related genitival adjectives were highly popular: the -assa type endings even superseded normal genitives in Luwian. We only have fragmentary evidence from Minoan, but it looks promising: Linear A names ending in I-ZA (*-itsa) likely belong to this class. According to some opinions, this suffix was not only used by substratum languages, but also had an effect on the development of Mycenean Greek: its endings were sometimes morphed into faintly similar structures, i.e. μελισσα (*melitia) = 'bee' from μελι = 'honey' or ϝανασσα (*wanaktia) = 'queen' from ϝαναξ = 'king'. Nevertheless, it is hard to track the origins of this suffix, because Proto-Indo-European also had a very similar form of singular genitive (variously reconstructed as *-(o)s, *-oso or *-osyo) and related adjectives. Only one thing is certain: these formatives almost invariantly express a possessive sense of meaning. The same should be expected from the cited toponyms. Of course, some names can come in more than one version. Apart from spelling variants (i.e. Kérinthos [Boiotia] is almost certainly the same name as Korinthos [Isthmos]), there are some regular changes as well. Most common are pairs with and without a formative. Harald Haarmann gives a nice collection of them in his publication (2007): Alos (Thessaly) vs. Alinda (Caria), Bargos (Illyria) vs. Bargasa (Caria), Kyrba (Crete) vs. Kyrbasa (Caria), Leba (Macedonia) vs. Lebinthos (Caria), Oinoe (Attica) vs. Oenoanda (Lycia), Passa (Thrace) vs. Passanda (Caria), Prinos (Argolid) vs. Prinassos (Caria), Sardos (Illyria) vs. Sardessos (Troad) and Tegea (Arcadia) vs. Tegessos (Cyprus). Stems with more than one ending - though less common - also exist, e.g. Alyssos (Arcadia) vs. Aloanda (Lycia) or Parnes [gen:Parnethos] (Attica) vs. Parnassos (Boiotia). A single place can also have more than one name: e.g. the Dirphys mountain in Euboia is also referred to as Dirphossos, and the township in Laconia by the name Kardamylessos is also called Kardamylé. In Hittite sources, some even more intriguing variations exist. The land of Caria is not only referred to as Karkiya, but also as Karkissa. One could argue that the different names were used by different languages spoken in the region, i.e. the Indo-European Hittites may have preferred the form Karkiya, while some indigenous Aegean tribes (the Karkas?) may have stuck with the form Karkissa. Such a "partial translation" of names can also explain the puzzling evolution of some toponyms. For example, it was always problematic for linguists to derive the Greek name of Troy, Ilion from the Hittite Wilusa. But the name Wilusa strongly looks Hattic: the -sa ending seems to be the same as that in Hattu-sa. If so, One could easily imagine a variant of the name in a more Indo-European form *Wiliya (that was not recorded in Hittite sources). From the latter, the Greek name Ilion would come simply and rather straightforwardly. Lastly, it should be mentioned that some of these names (especially the longer ones) also enable us to reconstruct some more complex word-formations of Aegean tongues. For example, there is the group of names ending not just in *-na, but in *-sarna (Phalasarna, Alasarna, Halisarna, etc.). Since the stem *sar- has a meaning 'upwards', 'high', 'great', etc. in all Anatolian languages (also do not forget the Etruscan words śar = numeral '10' and srenc = 'mural' or the Philistine seren = 'prince') it is reasonable to translate these place-names as '-burg' or '-castle'. Just remember that the germanic word burg or borough (or Greek pyrgos) also comes from an IE stem (*bhregh-) meaning 'high'. Incredible work! I can appreciate the time it must have took to assemble this altogether. Awesome and well done. Now let's get our hands dirty. There is no Hattic genitive case in *-as but rather in -n, as in Wurun-Katte 'Lord (katte) of the earth (wuru-n)'. Hattic's markedly different from PIE, Aegean (ie. "Pre-Greek") and Semitic language groups. A Hattic urbonymic -sa is believed to underlie Taruisa- and Wilusa- although, despite this, Wilusa- is attributed to an Indo-European root *welu- 'meadow' (presumably related to *welu- 'to roll' as in 'rolling hills'?). I've casually mused in the past that Taruisa- may relate to the Hattic god of storm, Taru, and so maybe Hattic *Taru-sa 'The city of Taru' is possible. Etruscan śar '10' is an unlikely comparandum to a hypothetical *sar- 'great' but note however Etruscan sal 'great, noble' (cf. Hittite sallis 'tall'). Then finally, a warning about toponymic endings. I notice that it happens fairly frequently that an ending from a foreign language will be preserved in another language or that a language will expand upon the existing ending (as appears to have happened with Etuscan Capevana 'Campania' > Latin Campania with -ia enlargement). Tracing the origins of these names can run into conflicts between the source language of the roots versus the source language of the affixes. Hi Glen. How you'r doin'? Thank you for your comment, especially the corrections. I noticed that I remembered the Hattic declensions incorrectly (the -su/-us) ending is either an (animate) accusative marker or an enclitic 3rd person pronoun, so I quickly corrected my post. As for the evolution of endings, I observed some rather strange evolutionary tendencies, too. For example, it seems that city-names ending in -na were so common on Crete that towns that were established at a later date also often received this ending. For example, there is Eleutherna (a doric town) with a clearly Greek stem, but a pre-Greek style of ending. Interesting, but as for the names in -ssa, -ssos it has to be said that Greek -ss-/Attic -tt- (earlier probably ~-ts-/-tš-) is the regular reflex of old -tj-/-kj-. So some of the names might simply be Greek derivations in -jo-, -ja- from a stem (a name?) ending in one of those consonants. "melissa" is very likely from "*melitja" derived the stem "melit-" apparent in "meli, -itos", "wanassa" is simply the common motion feminine in -ja "*wanaktja" to "wanax", stem "wanakt-". In don't know about modern Greek but "-ousa" looks very much like the classical feminine participle ending "-ousa" (from "*ontja") too, doesn't it? The Etruscan patronymic (if you can call it that), is -(i)ša, with palatal s. I am not sure if you can call it a suffix either, it looks more like an enclitic pronoun attached to the Genitive of a name, with an "i" intervening with Genitives in "-al". "arnθališa", "larisališa" but "marceša", "veluša", possibly still spoken as "marceš-ša", "veluš-ša" since in the few cases they are recorded in Latin they commonly have the ending "-ssa". The same ending may be represented in Lemnian as "-šia", "holaiesi φokiašiale" Dative of "*holaie φokiašia" and probably "vanalašial" Genitive of "*vanalašia" (etr. veneluša?). I somewhat doubt this is the origin of the Greek placenames, but who knows. Hi, I came over here following Glen Gordon's link to this entry on Paleoglot. I hope you don't mind a few remarks? As you probably know, Greek (non-Attic) /ss/ may also go back to Proto-Greek /tj/ and /kj/. This is the source of the /ss/ in melissa (Attic melitta from *melit-iH, and (w)anassa can be explained in a similar fashion (*wanak-iH). So there is a chance that some of these place names contain suffixes -tj- and -kj- (or combinations of stem /t/, /k/ plus suffix /j/), especially the Attic toponyms in -tt- that you mention. It would also be possible that the Pre-Greek language(s) these toponyms come from had an affricate here that was identified with the outcome of /kj/, /tj/ at one point of the Greek language history and then became /ss/, Attic /tt/. I am aware that derivation of terms like melissa and wanassa are possible with regular phonetic developments withing Greek as well. A feel very ashamed because I forgot the author of the article where I read all this stuff about Pre-Greek influence on Greek developments. All I can say at the moment, it is not my proposal, but I shall look it up again later, to see if I can find my source again. The Ionic and Attic toponyms are a different matter. Of course it is pretty much possible that the suffix originally contained an affricate (the Minoan version likely did). The -tt- / -ss- ambiguity can indeed be well explaind by an affricate (Beekes has proposed -ty-). Within the post, I just wanted to stress that the Ionic territories are the least conservative with respect to Pre-Greek toponyms. Also, the -nth- containing endings frequently changed on Ionic (not only Attic) territories, see Millawanda vs. Miletos or Parnethos (gen. of mount Parnes), likely reflecting earlier *Parnanthos (cf. mount Parnassos). I cannot exclude a perfectly IE origin of many of these endings, because of some strange facts: The -and- type endings were applied in Hittite as "agentives" because the derived words were strictly animate, so they could have been used as subjects in sentences. But if you observe, the Greek derivatives behave very similarly: they are either feminine (-ntha) or masculine (-nthos), you will not find any neutral ones (*-nthon ones are nonexistent). This matches very well with Hittite, but not with any other language without an IE-type gender system. Lastly, a few words on the Etruscan patronymic: It is well known that many words show s-ś alternation in Etruscan, the latter consonant likely being a relatively recent development. This is why I did not mark palatalization, although it might have been a grave error to disregard. I found the proposal to my liking, but the evidence is too sparse to identify a Lemnian -śia ending: the given structures are also consistent with a double genitive or dative (-śi-ale, perhaps an enclitic structure or Suffixaufnahme). Otherwise the distinction between the patronymic and the genitive-derivatives can be an artificial division: as I suggested in the post, the -ssos type endings seem to reflect a genitival adjective, likely derived from an earlier "true" gentitive! Absolutely non convincing for someone who knows the modern Greek language well. Stems like -ss-, -nth- and even -rn-, -rs- and almos all combination of consonants in pairs or threes are common in local spoken Greek. They come from the omition of one or more vowels between. For example, the plant "anithos" (anise) is pronounced "anthos" in many rural areas. Notice also that "anthos" means flower and could well explain the suffix of many toponyms. The verb "apofasisa" (I decided) is pronounced "apofassa", "perysi" (last year) becomes "persi" etc. I cannot find any combination of consonents that cannot be produced in local greek, not to mention dialects. The whole above essay was a waste of time. In researching this, do you encounter any or many toponyms ending in -kos? Since childhood I was interested in a variety of sciences. My interests range from molecular biology to mathematics and from history to linguistics. This blog you can see here was made with a dual purpose: first, to share whatever tiny discovery I came across while studying the ancient Linear A and Minoan Hieroglyphic texts, and for everyone to freely discuss, contest and supplement whatever topic I currently bring on. Please, remember that this is a hobby, not a profession. So while I appreciate (and even thank) your comments about inaccurate posts, do not take my head off for such issues. Thank you and have a good time!